The latest game in the GIPF project that I was able to check out was Dvonn . In Dvonn, each of the players takes a stack of discs and is attempting to control the most discs at the end of the game. To start, three red "Dvonn" discs are placed on the board. 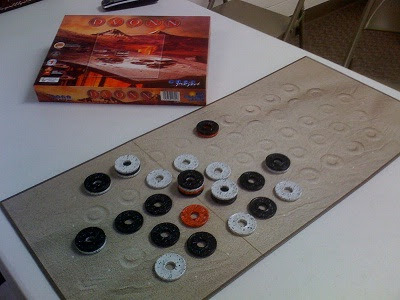 After this, players take turns placing discs one at a time until all of the discs have been placed and all of the spots on the board are covered (when placing discs, they must each be connected in some way to the "dvonn" disc - either directly or through other discs). Once all of the discs have been placed, the players begin to "jump" their discs into stacks. The distance that each stack must jump is dependent on the size of the stack - if it is a single disc, it jumps exactly one space; if it is a stack of 6 discs, it must jump exactly 6 spaces. The two special rules here are that the stacks cannot jump to an empty space and any pieces that become disconnected from a "dvonn" disc are immediately discarded. Once no legal moves are left, each of the players takes the stacks that they control (the ones with their color of disc on top) and stacks them on top of each other (this is to make counting the discs faster). Whoever controls the highest stack wins. Pros and cons of all of the games from the GIPF project are very difficult for me to write (and thus wind up sounding very similar). This is because I am not accustomed to spatial reasoning games, and so they challenge my traditional way of thinking about games. With that said, this is the first pro for both Dvonn and the project as a whole. The strategy of these games always makes me think using areas of my brain that have become rusty. They challenge me to not think financially and militaristically (like most games) but to think spatially. The next pro about Dvonn is the number of strategic elements in the game. Whereas I felt that Zertz occasionally struggled with depth of strategies, I feel like Dvonn exceeded my expectations. Players must strategize where to place their discs initially, which stacks to jump, when to jump them, how to stay connected to the dvonn discs, when to remove connections from the dvonn disc, etc. This depth allows players of Dvonn to keep coming back and to continue being challenged. The first con that I have found with Dvonn was related to some of the levels of strategy that I just mentioned. Some aspects of the game that I'm convinced are very strategic I have a difficult time determining what that strategy should be. Specifically, when placing initial discs, I have no idea what good "strategic" placement of discs entails. All of the games that I have played consisted of both players placing these semi-randomly and very quickly in order to get to the "meatier" part of the game (the part where thought we could have a decent strategy). Whereas this depth level of the game is good, it is still somewhat frustrating to have this part be so abstract that I have no idea if I did it well or not. Overall, I give Dvonn an 8.5/10. I still think that I like Yinsh just a touch better, but in a very close race. I would highly recommend Dvonn to anybody that likes abstract spatial reasoning games, and I would warn off everybody that does not.